Adam Koscielski represents clients in a wide range of complex civil litigation cases, including the defense of personal injury, property damage and product liability matters. Committed to ensuring his clients are informed throughout the process, Adam is involved in all phases of litigation from intake to resolution. Prior to joining Hinshaw as an associate, Adam was a summer associate, law clerk and intern with the firm. He was also an intern for a U.S. Congressman and U.S. Senator, both from Ohio. 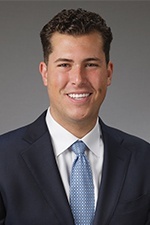 During law school, Adam was an active member of the Business Law Society and a student clinician at Loyola University Chicago School of Law's Business Law Clinic. As a student clinician, Adam counseled and advised local for-profit and not-for-profit businesses on a variety of issues, including business formation and governance, employment law and general corporate matters. Adam enjoys exploring Chicago's diverse food scene, golf and traveling abroad. He is also a member of the firm's 16" softball team.